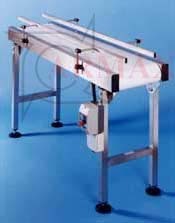 Belt conveyors are generally used on assembly/packing lines, or in clean areas such as the food and the pharmaceutical industries. 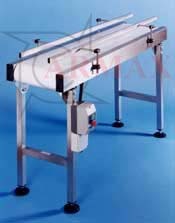 Belt conveyors will utilise either PVC / PU (smooth or gripped), Rubber or Modular depending on the application. Belt systems can either be fixed speed or variable speed. Variable speed units use a speed controller called an inverter (please note that where variable speed units are used, the nominal speed can be increased and decreased by approximately 35%), most fixed and variable speed systems can be run on both 3 phase or single phase. The drive will be either:- an externally mounted shaft driven motor (for heavier or long distance loads), or a motorised drive drum (a fairly recent development in materials handling solutions) where the motor is self contained within the leading roller. For single direction the construction will usually be end drive tail tension, and for reversible systems the construction will be centre drive and tension. Typically they directly convey individual products prior to packing/packaging. Normally belt systems run from 7m/min up to approximately 30m/min. Depending on the design. Loads of up to 100KG can be accommodated. The Mobility Tracking Belt Conveyor (images below) is built to the most modular of designs, and arrives at the client with either a single or three phase plug (depending on the physical length) ready for immediate usage. The Unique selling proposition of the tracker is it's tracking strip profiles on the underside of the belt, which eliminates the problem of endless tracking difficulties. To meet the demands of growing sectors, and as part of our standardisation plans we have now developed the stainless steel tracker conveyor, to be used mainly in the food industry or in situations where there is water or a moist atmosphere. Motorised drum, frames and supports are in stainless steel, so too are the optional guides. In addition to standard horizontal and incline belt conveyors Mobility also offer bespoke systems including spiral conveyors for accumulating, cooling down or space saving operations. Photographs below illustrate the types of systems previously supplied. One of the main advantages of the spiral system is that although the operation is declining there may not be the need for flights as each level is at a slight angle (this depends on the nature of the product and the friction between surfaces). The maximum belt width for a spiral turn is 300mm, but for wider products separate belts will be used together to create wider systems.